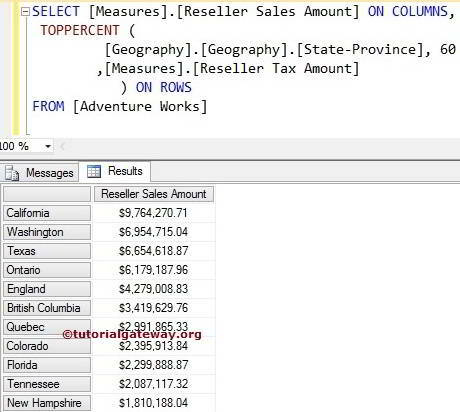 The MDX TopPercent function will sort the given data in the descending order and then selects the required number of records from the sorted data whose total is greater than or equal to specified Percentage. Numeric_Expression: Any Multidimensional Expression or measure. The TopPercent function will use this Numeric_Expression to sort the data in descending order and then picks the number of records required to match the percentage. 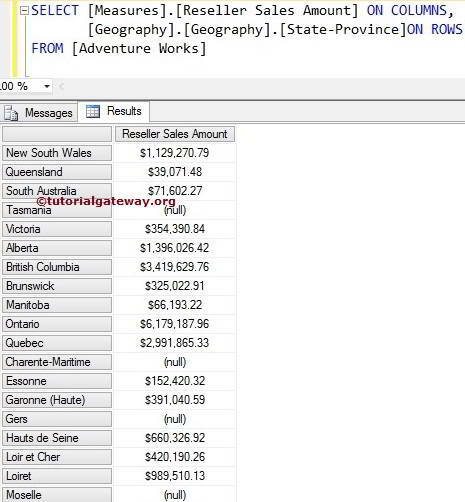 In this article we will show you, How to write TopPercent function to extract the States from Geography Dimension (present in the Adventure Works Cube) who has contributed 60 percent of total sales in Reseller Sales amount. For this, we are going to use below shown data. The following query will return all the states present in the Geography Dimension who are contributing 60 Percent of total Reseller sales Amount. 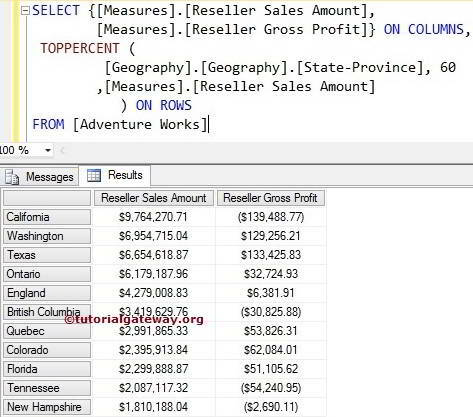 In the above MDX Query, We selected the [Reseller Sales Amount] Measure on the Columns and [State Province] column present in the geography Dimension on Rows. Next, TopPercent function will sort the data in the descending order using Measures. [Reseller Sales Amount] and then find the percentage of sales from total sales. If you observe the above screenshot, they are not the 60 Percent rows of Total records. If you total the Reseller Sales Amounts present in the above screenshot, it will be greater than or equal to 60 percent of the Total reseller Sales Amount. In short, above mentioned states are contributing 60 Percent Sales of total sales. NOTE: Please use the appropriate Measure as a third argument in the TOPPERCENT function otherwise, You will end up with wrong results.